How do you like the new blog design? I love the funky bird! I think I like playing with the blog design as much as I like blogging itself. I spent some time surfing to find a new design and came across Simply Fabulous Blogs (which ARE simply fabulous!) and downloaded this baby. If you want to update your blog here are 5 great sites with cute, FREE blogger templates. In addition to playing with the blog I played with the all new Sharing Memories Scrapbooking website. I really like the new design (which I did all by myself thank-you-very-much!) and although I still have a few things to fix and tweak, it is pretty much ready to go. I am planning for a big "grand opening" for the beginning of July, but do drop by and tell me what you think. I plan on posting regular scrapbooking features, articles and layouts on that site and will leave this site for my personal and family stuf. I love keeping this blog because as I look back on it, it becomes like a diary or journal - priceless. 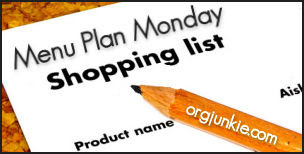 In other news...it's Menu Plan Monday! What an easy week! I only have to really "cook" a couple of nights and I have most of the ingredients in the house so it will be a quick trip to the grocery store as well. Don't forget to visit orgjunkie to see all the inspiring menu plans others have posted. I have found many a good recipe out of that list!